A nearly half-million-dollar grant will allow for a second clinic. The Mobile Health clinic team (from left): Senior Program Coordinator Patrick Rivers, Medical Director Ravi Grivois-Shah, Community Health Educator Nury Stemple, driver Jesus Marquez, nurse practitioner Elizabeth Knight, medical assistant Edna Rodriguez, nurse practitioner Angela Brown and driver Greg Loring. A program providing mobile health services has received a grant that will allow it to expand by bringing a second mobile clinic into full service. 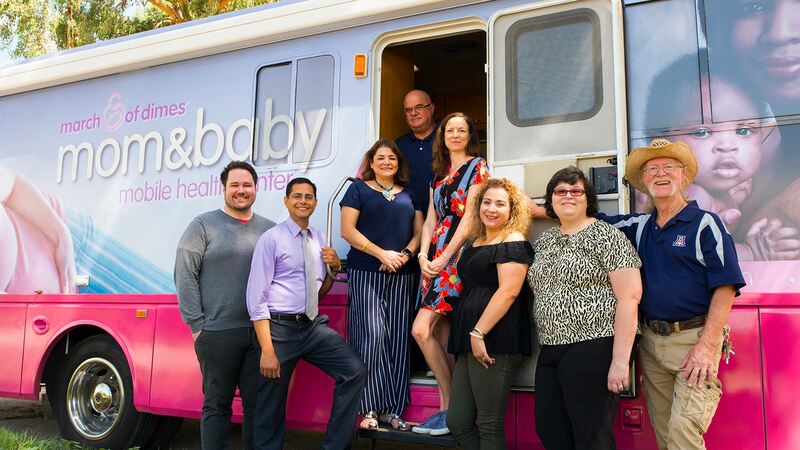 The Mobile Health Program, part of the the University of Arizona's Department of Family and Community Medicine, received the $450,000 gift from the Banner Health Foundation. Ravi Grivois-Shah, medical director of the program, says the clinic serves a full spectrum of the community. "We see kids, we do a lot of school physicals and well [check] visits along with sick care for kids. We'll see adults with chronic disease, or trying to prevent disease. We'll see older patients as well, later on in life. And then, we take care of patients during their pregnancy." Shah says the program currently has two part-time nurse practitioners and two physicians, as well as medical assistants and a community health worker. The money will support staffing and operations for a second mobile clinic and will essentially double the number of patients seen per year. Currently, the mobile health program provides patient services to about 2,400 people in southern Arizona where little or no health care services are available.